This was the immediate response I got from my mother when I told her that we were thinking of taking six months out of our lives to hike the 2,185.9-mile Appalachian Trail. Although not completely horrified, she wasn’t exactly thrilled. My father’s reaction was interesting but just stemmed out of concern. Well that’s my parents for ya. Now, I am in no way trying to humiliate or degrade my parents. They’ve had to put up with all my crazy travel ideas and moving 1,000 miles away from home. They’re troopers, really. And in all honesty, they are supportive, but when I first started dappling in travel, it took them some time to understand. I started out writing this post for parents to read, but honestly I think it is good for travelers, or those of you thinking about traveling, to read as well. Every adult child and parent dynamic is different, but some parents tend to have the same reasons behind their emotions when it comes to their adult son or daughter traveling for the first time or anytime. Some moms and dads might believe that their child is not responsible enough for travel, whether it be financially or otherwise. Other parents might feel jealous, because they didn’t embrace the nomad lifestyle during their ‘youth’ (I put youth in parentheses because there is no age limit to travel). Or in my case, my dad fears for my safety and well-being, and my mom gets bummed about lengthy periods of time without contact. First and foremost, most of these excuses are reasonable, making them valid for a parent to express and pertinent for a traveler to understand. If you are an ill-equipped traveler (no money, gear, knowledge, etc), it will be harder to convince your parents that you are suited for the nomad lifestyle. You might need to take a step back and reexamine or reschedule your leave date. I know we as adults should embrace wanderlust without our parent’s opinion ruining our dreams. I never want to hear that someone cancelled their trip because their mom or dad didn’t want them to go. If you want to travel, do it. But these tips below will help you if you just want to learn how to ease your parent’s worries regarding your wanderlust lifestyle. If you feel that you are well-prepared for travel and are getting backlash from your parents, you could do one of two things: forget what they think (and go for it) or convince them you are ready (and go for it). Either way, once someone has caught the travel bug, it is nearly impossible to get rid of. Parents need to be reassured; travelers still need to travel. Below are my tips on how to approach the subject of travel with parents, from the perspective of both the parent and the traveler. Don’t be petty and selfish. If your son or daughter is well-prepared, don’t let your worries or wants interfere. However, you do have a right to ask questions. Do not immediately dismiss the topic. Allow your son or daughter to explain their desire to travel, as well as discuss travel plans and budget. If you are a good parent, you already are a rock star at supporting your kid. So, this is no different. Stay involved in the planning process, ask to see pictures when they return, and encourage them to enjoy travel often. If you truly feel that your son or daughter is not prepared for the type of trip they are planning, suggest another option instead of crumpling their travel dreams altogether. For example, if you fear that they will run out of money on a four-month vacation to Thailand, suggest a cheaper location or to shorten the trip. If you have the type of parents like I do, you will get a lot of questions about your itinerary and budget. Be prepared! Have actual evidence with you (e.i. maps, budget charts, rough itinerary spreadsheet). If you don’t have at least a rough plan and cost of the trip, you aren’t as truly serious about it in the first place. So parents get concerned! It’s really not a surprise, so don’t act annoyed when they address you with their concerns. Be patient and professional. Have an answer for their concerns (without being condescending!). Since both my mom and dad are really concerned about my safety 100% of the time, I don’t tell them that I might need to hitchhike, unless it comes up. Withholding certain information like this that doesn’t necessarily pertain to your itinerary will prevent their worries. When you are ready to go on your trip, with or without your parent’s consent, give them information on how to contact you while you are away. This is smart and safe because someone will have knowledge of your location. And, it’s great way to stay in touch with your parents. Call them when you can; it will let them know that travel really is for you and that you are having a great time, easing their worries. Me and my parents on the train through the Royal Gorge in Colorado! 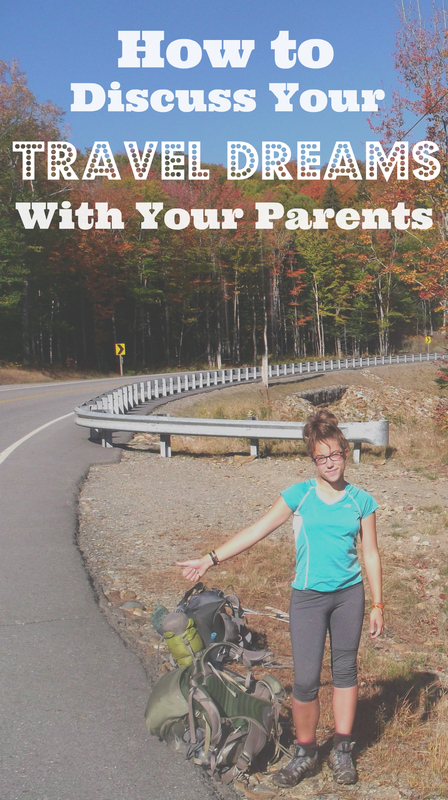 Do your parents worry when you travel? Tell me how you deal in the comments below! My mother wasn’t very happy when I decided to quit my corporate job to travel. She literally burst into tears, when I visited to tell her. My dad just shook his head and said, this is some stuff a boy would do. We lived in different countries, and at the end of my travels, I ended up moving to hers. Guess who’s super happy now. We’ve lived in different countries since I was in 5th grade. Now we’re neighbours. Luckily for me, my parents have never had a problem with me travelling – either by myself or with my boyfriend. I give them a detailed copy of my trip itinerary so they know exactly where I’ll be staying, flight numbers etc., and check in with them via email fairly regularly so they know how things are. I remember when I first travelled solo to the Czech Republic and Austria my colleagues (I was working in a French school as an English assistant) were more worried for my safety than my parents! They just worry about you, and it’s something impossible to understand until you have children of your own. My mom, for e.g. had the same reaction to my going off to Nepal as she did to my getting a motorcycle. She didn’t care what the specifics were, only that it entailed danger. That said, most parents realize that whatever makes their children happy is what they are going to do. The only way to ease their pain is to stay in contact, by phone preferably. Doesn’t need to be super frequent but it needs to happen.